I first met Shivinder Mohan Singh when at HT we broke the Rajan Nanda owned Escorts Hospital sale to Fortis for Rs 600 crore and change. We kept in touch thereafter and he was always quick to help if someone needed attention at one of his many hospitals. Text messaging worked best and one can say that we were SMS buddies. I found him polite, very sober and always willing to help. Now I find the same Shivy caught in a maelstrom. The recent history of the Singh Bros is well known to bear repetition here but from the time he upped and ran to Satsang Beas, I have always wondered what was happening with the scions of the great Ranbaxy empire. First came the crush at Ranbaxy as Japanese Daiichi Sankyo claimed that they had been sold a Chinese pup for $4.6 billion, then the fire sale to Sun Pharma. Then came the fusillade of sidewinder missiles aimed at Ranbaxy on transparency and corporate governance norms. I have always believed that when the motives in any relationship become monetary, it becomes parasitic, for you don’t chase what you can’t catch, particularly when ego also gets involved. That is the most dangerous ground to tread on, two egotistical equals jousting for supremacy. And if they are siblings, hell hath no fury as brothers scorned by one another. Equally, smart people have persuasive demons and they don’t let you sleep. After all everyone has his or her ghost. Phantoms and ghouls abound in this take of Brothers Singh getting their wires crossed. For media it is fresh juice, for shareholders more pain and for regulators and investigative agencies an enormous ball of wax of unravel. In chess and war, you have to anticipate what your adversary will do, for the scenarios are played out in the mind. First strike for Shivinder, but retaliation will come from Malvinder. If Shivinder has his Babaji Gurinder Singh Dhillon in his corner, Malvinder too will find a bunny rabbit in what will be an attritional war of nerves. But let us not be taken in by this bluster and lose sight of the real issues of how India Inc runs itself, both brothers are guilty of taking decisions that now need to be explained. Rather an exposition of why most of these dubious decisions were taken in the first place needs to be placed in public domain and expounded upon. The culpability of the two brothers, their partners in crime Sunil and Sanjay Godhwani, their boards at the time and Dhillon’s role needs to be probed with great precision. Pertinently, Sunil Sunny Godhwani’s brother Sanjay helmed the aviation business Ligare Aviation till his ouster. Then, Godhwani headed Spectrum Voyages, another Delhi-based company whose services were similar to that of Ligare. Earlier this year, Spectrum took Fortis Healthcare and Religare Health Insurance to the NCLT over non-payment of fees. “Spectrum provides travel solutions. It had booked tickets and given other travel services to Fortis and Religare, but since 2014, the payment has been pending,” said advocate Priyanka Kakkar. In total, a payment of about Rs 1.3 crore is due, added Kakkar. Tendentious and invidious behaviour over the years on the part of the Bros Singh has to be explained and accountability assigned for they have indulged in asset stripping and diverting company funds without so much as a by your leave. They cannot be allowed to escape responsibility and liability for what has become a house of horrors. In the optics of a fire fight against a frenemy, the actual goal of fixing answerability should not be lost. Actually, the story of the decline and decimation of the Ranbaxy/Fortis/Religare empire is inextricably tied into Radha Soami Satsang Beas which is where Shivinder Mohan Singh is well ensconced. The centrifugal force in this story is without doubt Gurinder Singh Dhillon and his secret society. Bloomberg reported recently — Along the river Beas in North India sits a sprawling spiritual commune that’s somewhere between a traditional ashram and a Florida gated community. There’s a grand meeting hall with tiered spires and pearl domes, but also tract housing and an American-style supermarket. It’s home to 8,000 devotees of the Master: Gurinder Singh Dhillon. His group, the Radha Soami Satsang Beas, says it has more than four million followers worldwide. Many call him a God in human form. But in the secular world of money, Dhillon, 64, is a key character in one of the most dramatic collapses in the annals of Indian business: The unraveling of the financial and healthcare empire owned by the Singh brothers, Malvinder and Shivinder. It needs to be mentioned here that RSSB must be one of the largest landlords in north India, every small town and city has a Radha Soami settlement hidden in every nook and cranny. RSSB itself claims — RSSB’s main centre is Dera Baba Jaimal Singh, named after its founder who settled there in the late 1800s. Located in Punjab, the ‘Dera’ is a self-contained community with both administrative and residential facilities. Although the centres throughout the world are affiliated with RSSB India, each country’s administration is autonomous, with a Board of Management that operates under a standard constitution modified to comply with local laws and conditions. Administration is handled entirely by volunteers, and operations are funded through unsolicited donations. The organisation does not engage in any fundraising activities. Bloomberg added — There are more than 5,000 RSSB centres throughout India, and internationally RSSB-affiliated organisations hold meetings in more than 90 countries. Meetings are held in rented halls, community centres or RSSB-owned properties. The purpose of these gatherings is to explain the RSSB philosophy. The meetings are non-denominational and open to the public. No fees are charged and there is no advertising or proselytising. Over the years, the brothers’ main holding company loaned about Rs 25 billion ($360 million) to the Dhillon family and property businesses largely controlled by them, according to documents and people familiar with the matter. Some of those outlays were financed with money borrowed from the Singhs’ listed companies, and when combined with other Singh investments gone bad threw their empire into a debt spiral, a Bloomberg News analysis of public records and interviews with 10 people familiar with the finances of both camps showed. Heirs to a generations-old business house once worth billions, the brothers have in the last six months seen a dramatic fall in their fortunes. They’ve had their public shareholdings seized by lenders. They’re under a criminal probe by financial authorities for over Rs 23 billion missing from their listed companies. They owe $500 million over fraud allegations related to the 2008 sale of drugmaker Ranbaxy Laboratories. They’ve also lost the family mansion. Both deny any wrongdoing. Dhillon is a cousin of the Singhs’ mother, and he became a surrogate father to them after the death of their own in the late 1990s. Since then, the finances of the spiritual leader and the brothers have grown intertwined, with money flowing from the Singhs to the Dhillon family via loans through shell companies and an array of arcane financial instruments, according to the documents and people familiar with the matter, who asked not to be named because of the ongoing legal probes. Dhillon hasn’t been accused of any wrongdoing. All members of the spiritual commune, including the guru, are expected to support themselves financially, and the sect’s representatives said the Master’s business dealings are a personal matter separate from his role at the spiritual group. Only months later the forces of the US FDA came down on Ranbaxy like a ton of bricks. It banned imports from two of the generic drug maker’s Indian plants. Then came the killer blow the same year with the US department of justice launching a probe, eventually resulting in a guilty plea by Ranbaxy and a $500-million settlement for selling adulterated drugs. The Singh brothers were not named in the probe. It ended badly in February 2018, with the Delhi high court upholding an international arbitration order directing the brothers to pay Rs 3,500 crore to Daiichi Sankyo for misleading the Japanese drug maker during the deal by withholding information. Remarkably, Japanese zaibatsu unlike Korean chaebol are risk averse and do thorough due diligence before entering a market or making an acquisition. The South Korean chaebol have performed admirably in India because they are risk takers and that is precisely why Hyundai, LG and Samsung have succeeded in India. So, it is baffling as how Daiichi swallowed a bitter pill only to discover its consequences barely months before the US crackdown. Meanwhile, one remembers how the brothers in unison did a round of meetings with media owners trying desperately to portray themselves as victims. Once the court ruling came, the charade was over. The unjumbling is always sudden and it always leaves a bad odour in its wake. Market regulator SEBI then got into the act along with Serious Fraud Investigation Office (SFIO); both opening an investigation of alleged money laundering to the tune of Rs 445 crore in Fortis, followed by a Luthra and Luthra report, which has blamed the brothers outright. A plethora of probes and court cases has become the norm as part of the reset. Earlier this year, Religare was taken to the Delhi high court by a New York investor. The promoters of financial services firm Religare Enterprises allegedly siphoned some $300 million to their privately-held firms. Subsequently, the company denied any wrongdoing. The “allegations were completely baseless and we categorically deny them”, Religare had told Bloomberg in an emailed response. The matter is now sub judice. They’re less generous to another follower of the spiritual group, Sunil Godhwani, whom they say was appointed to lead Religare at Dhillon’s recommendation. They say Godhwani was also in charge of their holding company, RHC Holding Pvt., and often took decisions without informing them. They say he was the architect of the financial structures, including the loans to the Dhillon family and companies, that led to their financial troubles. Bloomberg News has been unable to independently verify the Singhs’ claims that Godhwani ran their holding company in the period between 2010 and 2016, when most of the major borrowing, loans, investments and routing of funds occurred. RHC says he was president there between 2016 and 2017. Godhwani declined to comment, and he left his role as chairman of Religare in 2016. For his part, Dhillon also declined to be interviewed. A statement from JC Sethi, secretary of Radha Soami Satsang Beas, said Dhillon played a role helping the Singhs assert control of their father’s businesses following his death, and in guiding them after. But since 2011, ill health, including a battle with cancer, caused the guru to step back to focus on his spiritual duties, he said. “The Master can advise but he cannot make a choice for you,” he added. Representatives for the spiritual group said the Master has no role in its administration or finances. Earlier this year, Bloomberg News reported that the Singhs had taken Rs 5 billion from Fortis without board approval and that a New York investor had filed a lawsuit accusing the brothers of siphoning Rs 18 billion from Religare...The brothers went on to use their cash reserves aggressively to build up Fortis and Religare — which would each top $1 billion in market value as India’s demand for health and financial services surged. They took their father’s place in Delhi high society among other old business families, becoming patrons of Indian artists and socialising at exclusive clubs. Then in 2013, Ranbaxy pleaded guilty to criminal felony charges in the US and faced $500 million in fines. In an arbitration tribunal in Singapore, its new owner, Daiichi Sankyo, accused the Singhs of concealing the extent of its regulatory problems during the sale. The Singhs say they didn’t conceal any information. This is where the mysterious and reclusive Dhillon enters. Again let Bloomberg take up the narrative — By that time, Dhillon was playing a big role in the Singhs’ finances. He was their “central father figure” after their own died in 1999, they wrote in their statement. Sect members held key positions in the Singh empire: One became chairman of Ranbaxy’s board, helping ensure Malvinder’s swift rise to the top. Another devotee, Godhwani, led Religare. The Dhillon family would eventually become Religare’s second-largest shareholder, after the Singhs, with money lent to them by the brothers, according to people familiar with the matter. Godhwani consulted with Dhillon regularly on Religare, as would the Singhs on Fortis, the people said. In 2015, the younger brother, Shivinder, briefly took a hiatus from the business to work at the spiritual group full time. A photograph on the sect’s website shows Dhillon with a white beard, white turban and flowing white tunic. But several people who know him say he’s fond of self-deprecating jokes, and in private is more charismatic everyman than ethereal mystic. As many as 500,000 devotees sometimes visit the ashram at once to listen to his teachings of how meditation, vegetarianism and high moral values can help one escape the cycle of death and rebirth. “I think he’s a businessman in his mind first, and a guru second,” said Brian Hines, an American who was a member of the sect’s US community for 35 years and has visited Beas. He now blogs critically about it, having since left. In his blog, he has cast aspersions on the intricate dealings between the brothers and Dhillon — Wow, it really pays to be an Indian guru with the right connections. Check out this story, "SEBI nod for Radha Soami Satsang Beas.” (SEBI is the Securities and Exchange Board of India.) The capital market regulator has granted exemption to Logos Holding Company from making an open offer to the shareholders of Religare Enterprises for its acquisition of 19.53% stake in the company. Logos Holding is an investment arm of the Gurinder Singh Dhillon family. Gurinder Singh is the current head of one of India’s largest religious sect — Radha Soami Satsang Beas. At Thursday’s closing price of Rs 460.95, the value of Logos Holding’s stake is about Rs 1,163 crore. The Dhillons had acquired the shares at just over Rs 13 crore in 2006. After someone emailed me a link to this story, naturally I had to grab my calculator, find a rupee to dollar currency converter web site, and figure out how much Rs 1,163 crore and Rs 13 crore are in understandable American dollars. (A crore rupee is 10 million rupees.) Others can check my work, but I’m pretty sure the Gurinder Singh Dhillon family is the proud possessor of Religare Enterprises shares worth $257,187,507. Let's round it off and say... a quarter of a billion dollars. Malvinder Singh, an initiate of RSSB, is deeply involved in the Radha Soami Satsang Beas organisation, as is the rest of his family. This helps explain why the RSSB guru’s sons, Gurpreet and Gurkirat, each ended up with about 10 per cent of the shares in Religare according to a 2007 prospectus. On page 25 it says that Malvinder Singh and Shivinder Singh were allotted 49,575,000 equity shares in Religare at Rs 10 (about 23 cents) a share. Malvinder then transferred 6,250,000 shares to Gurpreet Singh, and Shivinder transferred 6,250,000 shares to Gurkirat Singh under guardianship of Shabnam Dhillon — almost certainly because Gurkirat is only 20 years old. The cost also was Rs 10 a share. So the guru’s sons each got 6,250,000 shares of Religare for $1,437,500 or thereabouts through an insider deal. Multiply $1,437,500 by two and we get $2,875,000. Which is almost exactly what the indianexpress.com story says the guru’s family acquired the shares for in 2006. So this shows that an insider deal (which is legal, and not to be confused with stock trading that involves the illegal use of insider information) resulted in a quick profit for the Gurinder Singh Dhillon family of about $254 million over four years or so. These financial deals can be viewed in different ways. Some people see nothing wrong with a guru who is considered to be “God in human form” raking in massive amounts of money from his involvement with Religare, a large Indian financial services group managed in large part by RSSB disciples. By 2010, another business opportunity emerged. Towns outside India’s capital, New Delhi, were experiencing a property boom that was turning farmers into millionaires. The Singhs’ resources were marshaled to help the Dhillon family build a real-estate empire. Two companies, Prius Real Estate Private Ltd. and Lowe Infra and Wellness Private Ltd., were set up by people close to the guru, and although partly hidden by layers of shell companies, the Dhillon family had ownership interests in both, people familiar with the matter said and filings show. Over the next two years, these firms together received about 20 billion rupees in zero-interest loans from the Singhs’ private holding company or its subsidiaries, according to the people and the documents. Funds were then disbursed to other companies controlled by the Dhillons. The Singhs owned a 51 percent stake in Lowe. These loans proved costly to the Singhs, coming on top of other major financial commitments that were underway. From 2011 onwards, the brothers’ holding company went on to sink at least 12 billion rupees to cover losses at their investment banking venture Religare Capital Markets Ltd. Other loans went to Ligare Voyages Ltd., a money-losing charter airline. (Ligare was incorporated in 2006 and was initially named Regius Aviation. Like in other companies of the Singh brothers, the aviation company was also marked by the presence of Gurinder Singh Dhillon, the head of Radha Soami Satsang Beas sect. 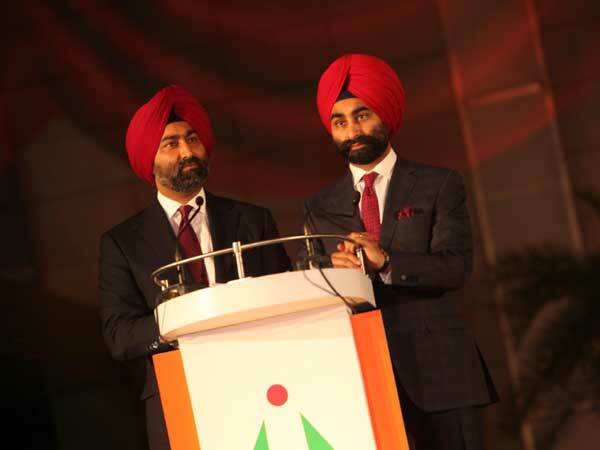 Shivinder calls Dhillon his ‘master’ and the sect his ‘spiritual home.’ Documents filed during the initial public offering of Religare Enterprises show Dhillon’s sons Gurpreet and Gurkirat Singh Dhillon as prominent shareholders of Ligare. Each held 12.18 percent stake in the company as on January 2010. Sanjay Godhwani held 2.53 per cent. Malvinder and Shivinder Singh together held over 70 per cent. The company went through two rounds of a name change. It became Religare Voyages in 2008, and finally to Ligare in 2012.) The Singhs’ holding company also loaned at least Rs 7 billion to cover losses at a firm that had been spun out of Religare to manage the financial firm’s administrative costs. The loss-making firm’s biggest expense was rent, much of which was paid to buildings owned by the guru’s family, according to documents and people familiar with the matter. In some cases, Religare had no use for all the space it was leasing from the guru’s buildings and large parts sat empty, the people said and internal documents show. RHC, the holding company, also made personal loans of Rs 5 billion to Dhillon family members, via a network of shell companies, people familiar with the matter said. The Singhs funded all these outlays to the guru’s businesses and to their own ventures with borrowing. And a substantial portion came from Fortis and Religare, often through the same network of shell companies used to lend to the guru’s family, people familiar with the matter said. Taken together, the zero-interest loans to Dhillon firms and Singh investments gone bad created a crushing debt load that required even more borrowing to service. Their total borrowings hit about $1.6 billion by March 2016, filings show. As things deteriorated, funds at the two primary public companies controlled by the Singhs, Fortis and Religare, were continuously routed back and forth via shell companies to deal with cash shortages elsewhere in the Singh family empire, according to multiple people familiar with the matter. Now as the brothers spar openly, at least the younger brother Shivinder has thrown the gauntlet down at Malvinder by taking him to NCLT making serious and offensive charges — Malvinder “forged the signatures” of Aditi Singh, Shivinder’s wife, in the documents of RHC Holdings Pvt Ltd, which along with Oscar Investments Ltd jointly-owned financial services firm Religare Enterprises Ltd and hospital chain Fortis Healthcare Ltd, it said. Malvinder and Godhwani “used their respective positions to perpetrate or cause others to perpetrate illegal financial transactions and various acts of mismanagement by and through RHC, leading to massive losses to RHC and its subsidiaries, and a depletion of the wealth,” the petition said. Their mismanagement put the company “into an unsustainable debt trap,” the petition has it said. Shivinder, whose public shareholding along with that of his elder brother was seized by lenders, besides being probed for illegal withdrawal of funds from Fortis Healthcare, wanted NCLT to remove Malvinder and reconstitute the board of RHC. “Malvinder Singh and Sunil Godhwani by putting RHC in a debt trap, acted prejudicially to the interest of its creditors and shareholders,” he said in the petition. Their financial malfeasance “destroyed a company worth Rs 5,000 crore,” the younger Singh’s lawyer argued at the NCLT on Thursday, when the case was first heard. “There are instances of Aditi Singh being shown as present for the board meeting of RHC when she was in fact abroad,” according to the petition, citing a board resolution dated September 25, 2014. Singh and Godhwani diverted Rs.750 crore from listed company Religare’s wholly owned non-banking finance subsidiary Religare Finvest to RHC through Laxmi Vilas Bank, according to the petition. Malvinder Singh, or persons acting on his behalf, caused Religare Finvest to create a fixed deposit of about Rs 750 crore with Laxmi Vilas Bank on November 19, 2016, against which RHC and its subsidiary Ramchem Pvt were granted a loan of about Rs.750 crore, it was alleged in the petition. “This eroded Religare Finvest Limited capital base and the loan availed by RHC against the fixed deposit remains outstanding till date,” Shivinder Singh said. The moot point here is that the two brothers were till recently together and wilfully involved in taking all business decisions. Ergo they are culpable for the same. They may be battling each other in court now, but both need to face a severe round of catechism so that the world becomes aware of all the deceit and dishonesty on their part. Charges and counter charges will be made by both parties, but in all this legal clutter, the essence of this narrative which is focus on their shenanigans and chicanery should not be lost for a minute. For years, the two brothers have defrauded shareholders and other people, it is time justice is served. All corporate governance and transparency issues were thrown out of the window and both are equally responsible for the rot till 2015 when Fortis Healthcare’s co-founder Shivinder said he would move on to serve full-time at the spiritual retreat Radha Soami Satsang Beas to pay heed to an inner calling. What cannot be ignored at any point in this tale of woe is how the boards allowed all this jiggery pokery to be done. Family owned corporates come with an inherent risk where financial defalcation and sleight of hand is commonplace as we have seen across numerous such instances. In 2009, Religare even gave 30 German luxury cars to top employees as retention bonuses. In 2015, when the spiral of debt and hopelessness had set in Ligare Voyages Ltd, which is associated with the Religare group was unable to operate any of its ultra-luxury jets for almost a month, including a Falcon7X that was seized in Mumbai by the Customs authorities. A Falcon 2000 each was seized in Madurai and Delhi, besides Beechcraft and KingAir jets. The jets were chartered by top industrialists and conglomerates in the country. These jets were seized due to non payment of duties from locations across the country. They had grown at a breakneck and reckless speed. Almost Rs 900 crore has been sunk into this aviation business, which has been loss making since its inception. By 2011, debt on the publicly traded Fortis had crossed Rs 7,000 crore (Rs 70 billion), and debt-to-equity, which a year ago was at 0.3, spiked 2.2 times. The reason given — The buying of promoter stakes in SRL Diagnostics for Rs 960 crore (Rs 9.6 billion) and the collective debt of Fortis International at Rs 3,270 crore. When the going got tough, they started paring their holdings - the profitable Australian subsidiary Dental Corporation was sold to Bupa Healthcare for Rs 1,550 crore. This was followed by junking Singapore-listed Religare Health Trust for Rs 2,200 crore, followed by hiving off Rs 370 crore worth of equity in SRL Diagnostics. Of course, this helped the company bring down debt to a reasonable Rs 2,300 crore and a debt-equity to about 0.6 times. One must also remember that more than 98 per cent of the promoters’ holdings in Fortis is pledged, and would eventually get sold to a new investor. Shareholders always get it in the neck, Shivinder and Malvinder cannot be absolved of their reckless decision making and bringing the legacy business into disrepute. On the role of the boards of these companies, the independent directors on them, the CFO and audit committees which allowed all this malfeasance to take place before their eyes forgoing all filters and security protocols, tarnishing their very image as gatekeepers, regulatory authorities now need to come down with a firm hand on this dubiously conducted business for years.